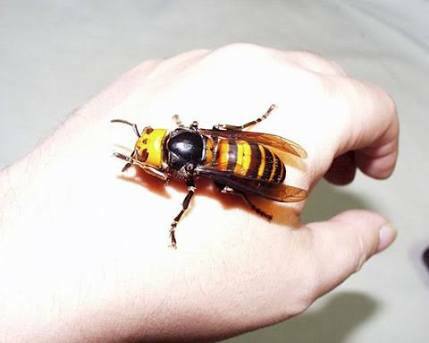 6 1/2 cm long wasps?????? Mmmm.........I wonder if those hornets could be re-routed to North Korea? A picture is worth a thousand words. !!!! 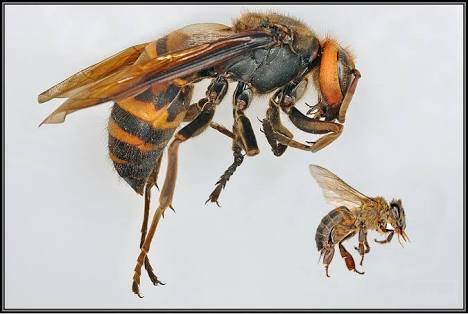 Believe they are called Tiger Head Bees. They hurt. Closest I can say is the initial hit is like being slapped by someone using a steel 12" ruler, get more than 10 or so hits it can make you feel really sick for a while. As you say so small and so fast it's almost impossible to see them hit and leave. As we have a lot of trees and bushes we do regular checks with an aerosol in each hand !! When I and a mate got hit walking past a hedge it was on our legs through Levi jeans. Mate got about 10 hits I got about 4 or 5. He felt sick for about 3 or 4 hours afterwards. We returned the next day and emptied 4 large spray cans on the whole hedge. Why not set it on fire?